There are several ways OneDrive can be used. The most obvious and convenient way is to copy files into the OneDrive folder on your machine and let them sync to the cloud in the background. However this does not serve our purpose very well because a local copy stays on the local machine. Furthermore, if we have linked other machines with the same account these files will be duplicated on those machines as well. What we actually want to do in this article, is to upload files to the cloud and remove them from local machine. OneDrive and OneDrive for Business. Alternatively, you can upload individual files of up to 2 GB in size using the web interface. However, changes done using the web interface are also automatically synced to all linked machines. On Dropbox (or, for that matter, also the consumer flavor of OneDrive) you can select individual subdirectories that will or will not be synced. With OneDrive for Business either the whole OneDrive directory will sync or nothing. Until Microsoft improves the OneDrive for Business client, I will show how to create an unsynchronized storage space on OneDrive for Business. The Business flavor of OneDrive is built on top of a technology called SharePoint. As an Office 365 Business subscriber you also have an access to something called a SharePoint Site. On your Site, OneDrive content is stored in what is called a Document Library. The underlying technology is so complex, you would need a certified MS consultant to explain it to you. But the point is, we can have multiple Document Libraries and each library can be synced separately. Your default Document Library called “Documents” is created for you and this is the default OneDrive location that will be synced when you set up OneDrive for Business on your machine. 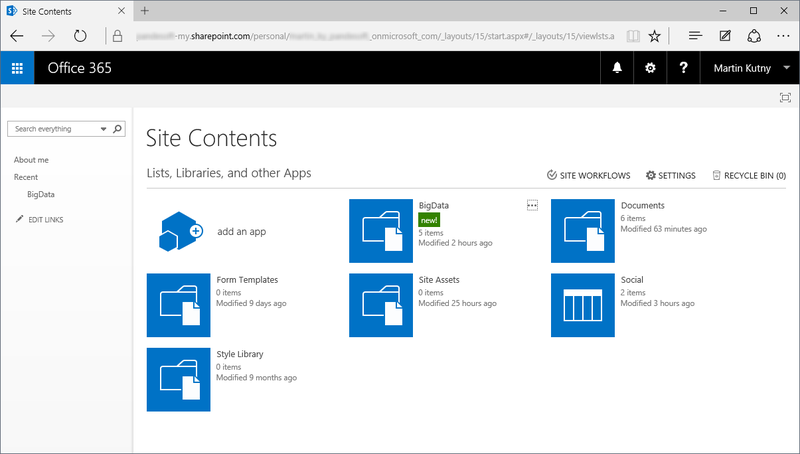 To manage your libraries, sign in to your Office 365 Portal, navigate to OneDrive and chose Site contents under the “gear” icon in the toolbar. Adding a new Document Library is easy – click on add an app, select Document Library, enter a name for the new library (I called mine “BigData”) and click Create. Once you closed your browser, navigating back to your new OneDrive storage is a bit tricky. Clicking on OneDrive button in the main menu will take you to your default “Documents” library. You’ll have to go through that “gear” icon -> Site content -> Your Library. The new library will not be synced to any machines. In the next section I describe various ways how to use this new library. Once you are logged in to your Office 365 Portal, the most straightforward way to use your new Document Library is directly through the browser. Navigate to your library as described above, upload / download / manage the content directly from the browser. This has the advantage, that once you upload a file, you can delete it from your machine and the file stays in the cloud. Uploading large files through the browser is not very convenient. The upload breaks if you close the browser or your connection is interrupted. You can sync the new library to a directory on your machine, just like the default library of OneDrive. You’ll need the URL of the new library: navigate to your library, in the LIBRARY ribbon toolbar select Library Settings, copy the URL presented at the top of the page (not the URL in the browser address bar). Now right click on the blue OneDrive for Business system tray icon and select Sync a new library. Paste the URL in the dialog, press Sync Now. A new cloud-synchronized directory will be created on your hard drive. This is the classic sync scenario. Everything copied to the synchronized directory is duplicated in the cloud and everything in the cloud is copied back to this directory. This way, files from the cloud are also available offline. The new document library can also be mapped as a network drive. Good step-by-step guide is here. This way, your files stored in the cloud will be accessible through the file system (the mapped drive letter) but without duplicating them on your local hard drive. Files on the cloud are only available as long as you are online. However, I found that copying new files to the mapped drive temporarily makes a copy of those files on the local hard drive. The copy remains there until the files are finished uploading to the cloud. 3rd party cloud storage client software (e.g. CloudBerry) can provide many more features such as: end-to-end encryption, resumable upload and download, multiple cloud storage backends and overcoming various limitations of those backends. Unfortunately I am not aware of any solid 3rd party client software for the SharePoint-based OneDrive for Business. I would be grateful for any suggestions. OneDrive for Business has a sharing feature which works best if you are going to share with other Office 365 users. Anonymous public sharing using a web link is limited to individual files, i.e. for each file you want to share you have to obtain a separate share link. You can’t send someone a public link to a whole directory. This entry was posted in Uncategorized on August 16, 2015 by martin.kutny.